(Bloomberg Opinion) -- If Britain’s vote to leave the EU was to have a silver lining, it was the hope that sterling’s slump would spark a long overdue re-balancing of the economy. A vast finance and services sector has brought many advantages over the years (bankers are big spenders and pay plenty of tax), but the cost of neglecting manufacturing is becoming increasingly apparent. Poor productivity growth, regional inequality, stagnant wages and a yawning current account deficit are just some of the problems made worse by de-industrialization. But while the weaker pound has provided a bit of support for U.K. exports since the 2016 referendum, a manufacturing renaissance – or “March of the Makers” in the words of former finance minister George Osborne – looks like a pipe-dream. Lately, the reverse has been happening. The country’s foreign-owned carmakers have withheld spending and cut jobs and models; Honda Motor Co Ltd. is closing its Swindon plant. Even home-grown successes like Dyson Group Plc are shifting investment elsewhere. The CBI, Britain’s biggest business lobby, warned last week that industry is “in despair” about Brexit and trade union Unite says the U.K. is “in the grip of a manufacturing emergency.” They have a point. Britain’s political leaders have played fast and loose with the future EU trading relationship and some have shown a willful disregard for companies’ concerns. Boris Johnson’s infamous “F*ck business” comment spoke volumes. As with so much about Brexit, this lack of seriousness is potentially disastrous given that most of the country’s industrial base is in the hands of overseas owners. Britain has happily carried on selling off its companies (from Arm Holdings Plc to Sky Plc) since the referendum. In a post-Brexit world, this isn’t sustainable. But there isn’t a huge amount left to dispose of anyway. The birthplace of the industrial revolution has a lower manufacturing share of output than in many other developed economies. As with the election of Donald Trump, the campaign for Britain to quit the EU appealed to blue collar workers left behind by de-industrialization. That Brexit will probably make things worse is one of the referendum’s cruelest ironies, and hardly the best way of defusing the populist impulse. For a long time, the British establishment (including Labour governments) seemed pretty ambivalent about this situation. It wasn't the government’s job to pick winners. Politicians saw a bright future in services (financial, business and professional) and the so-called “knowledge economy.” So what if big local manufacturers like Airbus, Tata Steel, Siemens, ABB, Bombardier, Ford, Jaguar Land Rover, Toyota, Nissan and BMW/Mini were all foreign-owned? Britain’s attractions as an investment destination – its universities, flexible labor markets and access to Europe – were plain. All would be well; and in fairness sectors such as the car industry thrived in a way they hadn’t under British owners and bosses. But some local industrialists have long argued that when the going gets tough, a foreign owner won’t feel a particular obligation to the country when faced with hard investment decisions. That theory is getting a good testing now that the U.K. is – voluntarily – trying to leave the world’s biggest trading bloc. The early signs are grim. Even today, manufacturing accounts for more than two-thirds of British companies’ R&D spending and almost half the country’s exports. Productivity growth also tends to be higher among industrials because of automation. Pay is higher too, particularly in carmaking. Having a thriving finance sector and industrial base needn’t be mutually exclusive either. 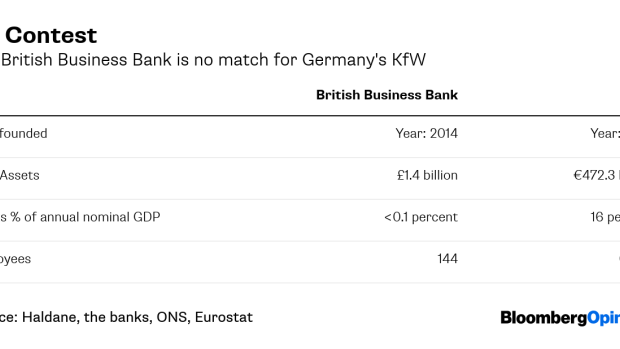 Switzerland manages, but the U.K. has struggled to balance the two. In short, those lucky enough to work in finance and own a home in southeast England – a group that includes many Brexiter politicians – haven’t suffered from the failure to support manufacturing. Outside London, it’s a different story. In fairness, Theresa May’s government has done some useful things. A 37 billion-pound ($48.7 billion) National Productivity Investment Fund will divert public spending toward infrastructure and R&D. She has also boosted funding for so-called Catapult innovation centers, which aim to mimic the success of Germany’s Fraunhofer research institutes in helping the Mittelstand. But Britain has to be bolder. Beefing up the U.K.’s puny national development bank should be a priority, as post-Brexit Britain will no doubt suffer a further drop in funding from the European Investment Bank and European Investment Fund. Instead of imposing punitive business rates on buildings and machinery, Britain could shift more of the tax burden onto landowners. Re-balancing the economy is hard at the best of times, but the uncertainty of Brexit is poisonous for investment. Sterling’s tentative appreciation won’t help either. And, unlike its increasingly dirigiste European neighbors, the U.K. has far less political leverage over its business sector. The future of British manufacturing will be decided in the boardrooms of Tokyo, Mumbai and Munich. It’s too late for the U.K. to suddenly turn inward. (2) This list is illustrative, not comprehensive. (4) See also this speech by the Bank of England'schief economist. It's debatable though whether the problem is access to finance or rather on the demand side.